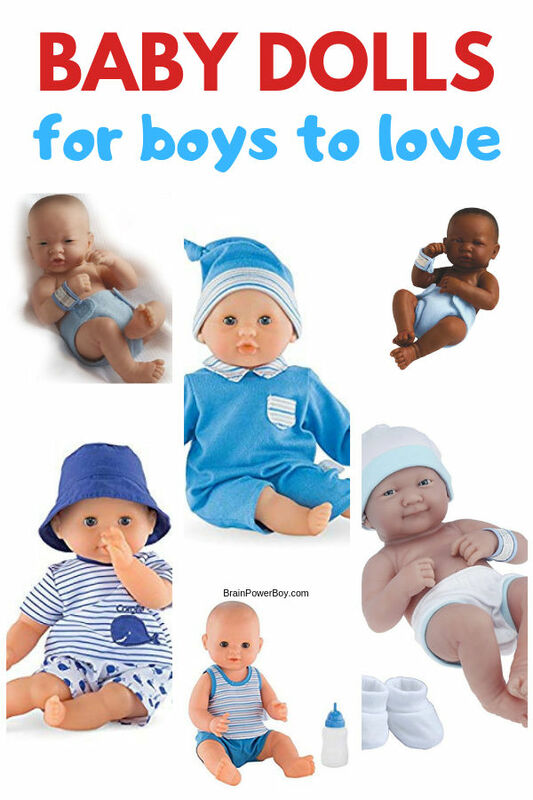 This is a wonderful selection of the very best baby dolls for boys. Boys really should play with dolls. There is so much value in giving them one of these great toys. They enjoy doll play; they really do. They hold them and carry them around. They feed them, bathe them, sing to them and love them. All things dads do, right? Consider it husband/dad prep! Getting a little boy a doll is one of the best gifts you can give him. You are giving him a chance to be gentle, and loving and take care of his doll. See all our gift ideas for boys here. If you’re planning to get a doll for a boy, use this doll buying guide to find the perfect one for your little guy. By getting them dolls to play with you are providing them with an experience to help them grow. They can be so gentle and loving with their dolls. In a rush, or don’t want to have to choose? See Our Top Pick Now! Soft, sweet and wearing a dino outfit this little guy is great for young boys. The features are embroidered (including a belly button!) so there is no danger of an eye coming off. His clothes can be removed which means dressing him is part of the fun. 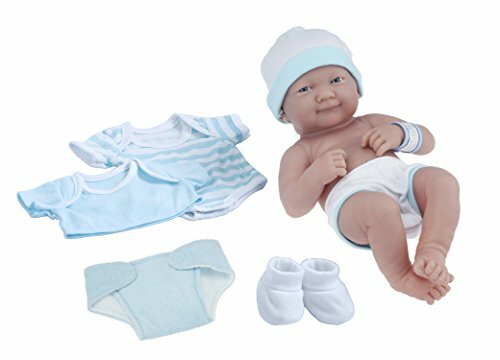 The First Baby Boy Doll won’t disappoint, and bonus, he is washable. Plus, it is an award winning doll. He is 15 inches long and for 12 months and up. If you are looking for a soft cloth doll for a little guy, try one of these. They are safe for the youngest wee ones. Snug-up Luis is by Haba. I really like that toy company a lot. They make high quality products with attention to detail. Even though he is soft, he is able to sit up. Luis is machine washable, 8 inches tall and for ages birth and up. He is great as a little boy doll. Highly rated! 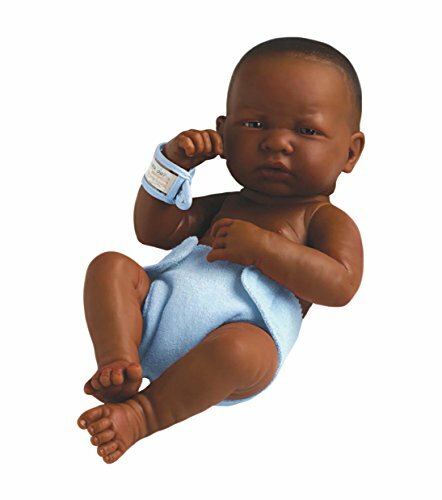 Baby’s First Doll African American Boy by International Friends made specifically for diversity. The fabric is velour. He is machine washable and dryable. He is 15 inches tall. No ages listed. This little guy called Wee Baby Fella has a cute plaid outfit with velcro making it easier for your sons or grandsons to be able to undress and dress him. He is 12 inches high, has a pacifier (or dummy if you call it that) which attaches magnetically, and is for ages 1 and up. 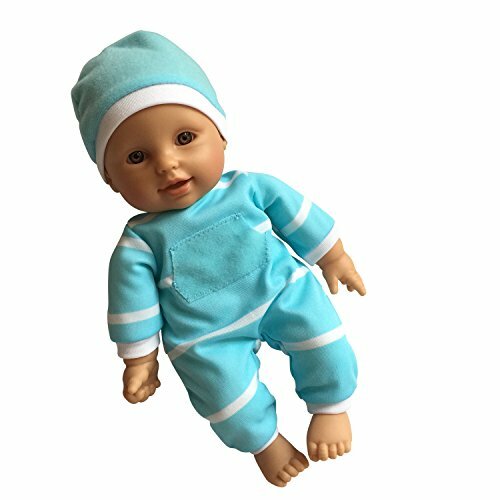 This charming baby boy doll is made for cuddling 🙂 He is super sweet and has a bean filled posable body. His eyes close when you lay him down. The face, arms and legs are vinyl and are slightly scented with vanilla. Just letting you know in case you have a child sensitive to smells. He is 12 inches long and for 18 months and up. Little Prince! This little guy is all about cuteness. Even the little frog on his striped outfit is cute! His clothes are removable so your little boy can dress him up. The bottle fits in his mouth as does his thumb. There are mixed feelings about the powder scented vinyl. Some think it is way too strong, others don’t mention it at all so I am guessing it didn’t bother them and others still like it. He is a charmer for sure. 13 inches long and for ages 1 and up. This is Little Beary Blue 🙂 Just look at that adorable face and cute hat and outfit!See the info above in Little Prince, as he is made by the same company and has the same information just a different outfit and look. 13 inches long for ages 1 and up. This is a very popular doll! Not only is he very nice, but he comes with a lot of accessories which expand the play value. The cute little elephant on his outfit doesn’t hurt either – adorable! He is a soft body doll with vinyl head, arms and legs. His eyes open and close. He is 15 inches long and is for ages 2 and up. These three little fellows come with accessories including a reusable cloth diaper, realistic hospital ID bracelet (which is removable in case you had a home birth), hospital belly button gauze, and birth certificate. I like that this series of dolls has a few different ethnic options with different skin tones available: Asian, African American and Caucasian are all available. They are very life-like and realistic looking and anatomically correct. The arms and legs move so they can be posed as well. This series has very nice reviews. 14 inches long and for ages 2 and up. It took quite a while to find a nice Hispanic baby boy doll with good reviews but I finally did. Super cheap! While smaller than some of the other dolls, it is very nice and comes with a one piece outfit and hat. Both are removable. Super cute, isn’t he? He is 11 inches tall and is for 18 months and up. They also make boy dolls that can get wet. I think this is great as they can take their doll into the tub to play. You know they are going to love that! 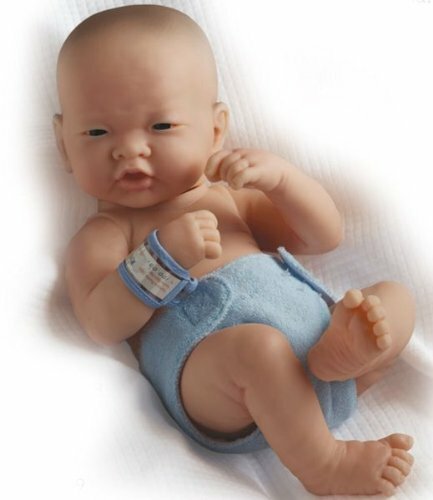 If you want a complete baby doll for boys gift set, this is the one to take a serious look at. For what you get this is an excellent value, I would even go as far as to say it is cheap! I couldn’t believe the number of reviews. This is a very popular boy doll. He comes with a full layette so boys can take care of him and dress him up. 14 inches long and for 2 and up. Rub a dub dub! What a fun doll. This boy doll is made for the bath. I would have loved having this one. It has soft vanilla scented vinyl. He is able to go into the bathtub, the swimming pool and sea water. There is a tab on the back so you can hang him to dry. 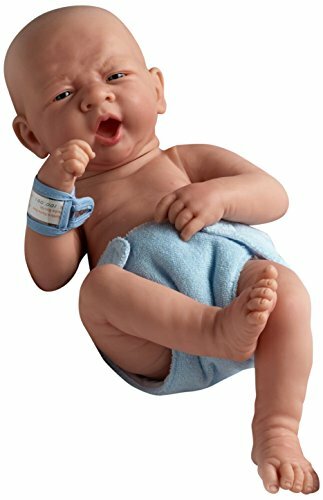 This is my top pick for a toddler boy baby doll. He would make a nice friend for him to carry around and play with. His outfit with the whale is super cute, isn’t it?! What a great companion for a little boy. 12 inches long and for 18 months and up. Paul has been updated! He is a drink-and-wet bath baby who happens to be anatomically correct and comes with a potty seat. His eyes open and close and he comes with the accessories seen below. Some people are using this to help their boys learn about using the toilet and for potty training. After giving water in the bottle, when you press his tummy, he goes! He can also be put into the bath. 14 inches long. 24 months and up. Playing with dolls is not a girly thing, it is a human thing. Boys are naturally loving and really enjoy themselves while playing with dolls. They are learning and having fun. Take some time to look through the dolls here and choose a doll for your special boy. We picked our favorites. Encourage him to show the soft, gentle, loving side of boyhood. Does your boy have a special doll? Leave a comment, I would enjoy hearing about your experiences with boys and dolls. Yikes the boy with the striped shirt looks pretty real! I’m sewing up some dolls as gifts for my kiddos’ second birthday, I think it’s important for boys to play with dolls as much as girls. Clare, Neat that you are sewing dolls for your boy (and girl!) to play with. I love homemade gifts. Emma, Many people agree with you! Oh yes, stuffed animals are great companions as well. Both of my boys have “fathered” dolls at some time. They learn to take care of others who are smaller than them with doll play. Yes, that is what I love about it as well. Play does help children learn so much. Love this! Your grandpa gave some good advice. Thank you for your comment. My grandson is two years old and had never really shown interest in doll but he was sick recently and would wipe his plush puppy’s nose so I think it’s about time. I raised two daughters so I’m not certain, would you recommend starting with a soft or more realistic (anatomically correct) baby? Good question! You could go either way. It usually comes down to what you think your grandson would like the most. If he likes to hug and cuddle a doll then perhaps the soft one would be a good choice. If you think he is more interested in dressing and playing with the doll the more realistic ones may be better because some come with removable clothing and are able to sit up better than the soft dolls. I hope this helps a bit. Overall, if it were me, I would likely get a more realistic one because I think he would play with it for a longer span of time. Best wishes on your choice! Thank you for stopping by.